In Sweden, which is famously on the way to becoming cash-free, you can find signs in shop windows that say ‘we don’t take cash because electronic payments are better for the environment’. Since cash does require a certain amount of resource use for its production process and transportation, and since in general we’re encouraged to go paperless as much as we can, this idea may seem – at first, anyway – to make sense. And if electronic money truly required only the modest amount of energy that goes into creating bank cards or whichever payment device is being employed, along with a bit more energy for moving the data around in cyberspace, then it would very likely be true. 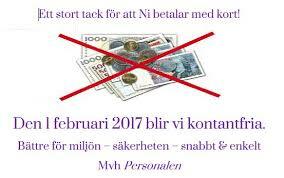 Indeed, a recent study by the Dutch central bank seemed to back up the Swedish store owners’ assumptions. It investigated the ecological footprint generated by cash and compared it to that of electronic payments, and found that cash was the loser. However, there’s a very important missing variable in the Dutch study: how the money comes into existence in the first place. With cash, that’s pretty straightforward. The central bank creates cash and it then gets distributed to private banks. (Corresponding deductions are made to their ‘reserve accounts’ at the central bank. Then it’s put into ATMs.) Apart from the up-front ecological costs mentioned above there is nothing else to worry about. Electronic money, in its current form anyway, is a very different beast. And since it makes up about 97% of money in circulation, it deserves serious attention. Contrary to common assumption, this money isn’t created by central banks. Instead, it’s created by private banks when they make loans – i.e., on a basis of debt. This means that in order for the electronic money to exist, someone somewhere has to be in debt. Two notable effects arise. One is that if the debt bears interest – as debts often do – then in order to be able to pay the interest, the debtor has to be able to generate a profit. This in turn puts pressure on the economy to expand, as increased GDP is the only sure way to generate enough revenue to be able to honour interest payments (it’s true that you can sometimes also roll over debts, or take on still more debt, but those practices aren’t exactly sustainable – or at least not for private debt). The second effect goes still deeper. It is that in order for there to be an adequate money supply at all, there needs to be a certain level of debt. If debt gets paid off, then the money supply will actually shrink unless new debts are constantly being created to balance out the paid-off ones. To put this loftily, you could say that it’s an ontological problem with bank-created money. In practical terms, it means that there needs to be constant credit demand. If there isn’t, there won’t be enough money generated to keep the economy going. It’s been estimated that if all debts were repaid, 90% of money would disappear. However, as the EU is finding right now, in times of recession credit demand tends to shrink. The best way to ensure that there’s enough confidence in the economy for people and firms to want to take on more debts, and for banks to feel comfortable making loans is – guess what – economic expansion, aka GDP growth. Again. So we’re locked into a financial system that requires GDP growth to be able to function adequately. The problem with that is – as is increasingly recognised– GDP growth is steadily killing the biosphere. To successfully eliminate greenhouse gas emissions and relieve the enormous pressure that’s being placed on biodiversity and our other key sustainers, the evidence is clear that what we actually need is aggregate economic contraction or degrowth. Yet if we want to survive in the short and medium term, we also need money. A more accurate metaphor for bank-issued money would probably be high blood pressure, often described as a ‘silent killer’ which can cause severe, sometimes fatal, damage to the circulatory system without having any obvious symptoms. (It’s true that there’s a certain amount of discussion now of the destabilising effect of the monetary system on the economy – but there seems to be very little awareness as yet of its environmental impact). 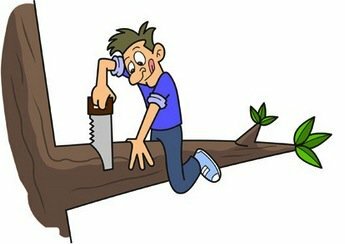 The added twist in our current situation is that the person sawing doesn’t have permission to saw any part of the tree other than the dodgy bit that will guarantee an abrupt and dangerous fall. It’s hard to think of a more absurd and perverse setup. Electronic debt-free (‘Sovereign’) money could be introduced into the economy by following the Institute for International Monetary Reform’s proposal that central banks, or some other governing body, take on the responsibility for money creation. (Some economists are suggesting that private banks be allowed to manage the money, backed by central bank reserves, but I think this would still give them too much power, especially as they often have a mandate to maximise profits for their shareholders.) This possibility was discussed in detail at a recent conference on the future of money, which you can read a report on here. You might be wondering why we generally don’t hear very much about this issue, since it’s clearly important. A major reason is probably a simple lack of awareness, both among the general public and among movers and shakers. After the recent referendum on debt-free money in Switzerland (which didn’t pass), a survey showed that 60% of Swiss people still thought that money was entirely created by central banks. What is perhaps more surprising is that a fair amount of central bankers also still seem convinced that private banks don’t actually create money, but instead simply act as intermediaries between lenders and borrowers. Thankfully though, the narrative on money creation is definitely beginning to shift. And for those who are already conscious of the real nature of electronic bank-issued money, some deep reflection on its environmental effects would be a very useful next step.